Kenny Dougall believes Barnsley’s impressive form over the festive period has given the squad the confidence they can win automatic promotion this term. The Tykes were deemed one of the favourites for an immediate return to the Championship under new head coach Daniel Stendel at the start of the season. The German started his tenure in impressive fashion, but back-to-back defeats at Sunderland and Wycombe saw the Reds drop out of the play-off positions at the beginning of December. That raised questions about whether Barnsley had the characteristics to mix it with the big boys in League One. But they answered their critics by enjoying a five-match unbeaten run against their fellow promotion rivals during a hectic fixture schedule. They drew with the top two, Portsmouth and Luton, and beat Blackpool, Peterborough and Charlton to sit only six points behind second place with a game in hand. And fit-again midfielder Dougall reckons that form has given his side belief they can finish in the automatic-promotion places come the end of the campaign. “In the last four games we’ve picked up 10 points, so it has been fantastic since Christmas,” the Australian said. “We’ve got a lot of work to do still; we’re aiming for the top two – that’s our goal and we won’t give up on that, we have to keep going. “This last period of games has given us real confidence that we can beat anyone in this league. 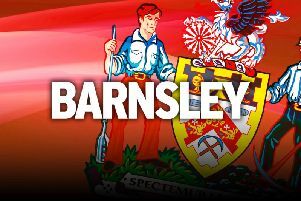 Barnsley tasted defeat for the first time since December 8 when suffering an agonising 1-0 loss at Premier League side Burnley in the FA Cup on Saturday. Stendel’s side were minutes away from securing a goalless draw at Turf Moor which would have set up a replay at Oakwell. But former Leeds striker Chris Wood stepped off the bench to score a last-gasp penalty, ensuring Barnsley’s sole focus is the league.